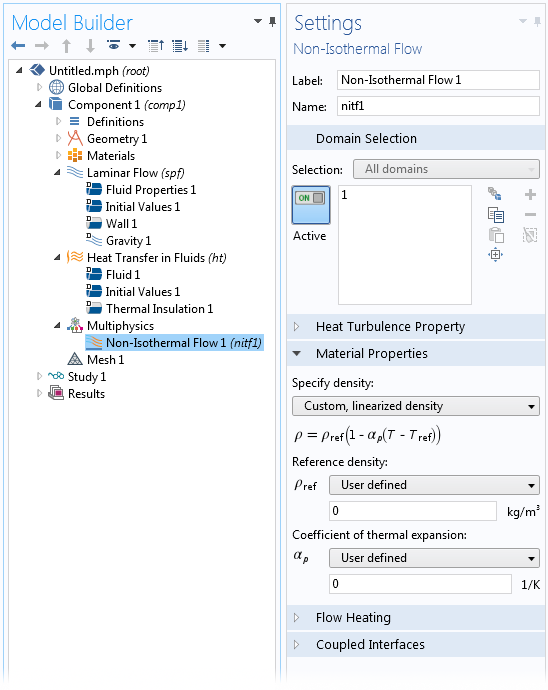 For users of the CFD Module, COMSOL Multiphysics® version 5.2a brings a new option for faster computations of certain nonisothermal flow simulations, the ability to easily account for gravity in CFD applications, the option to use the Boussinesq approximation for modeling incompressible nonisothermal flow, and more. Review all of the CFD Module updates in further detail below. The new Weakly compressible flow option for Compressibility can be used for nonisothermal flow when density variations with respect to pressure are negligible. This is the case for the majority of flows at Mach numbers less than 0.3. 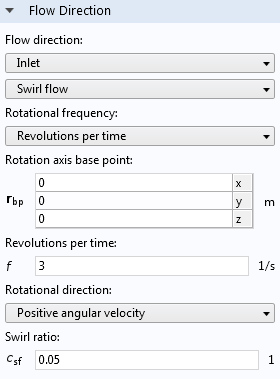 The advantage of using this option instead of the Compressible flow (Ma < 0.3) option is that pressure waves, traveling at the speed of sound, need not be resolved in time-dependent simulations. This allows for a larger time step to be used, resulting in faster computations. 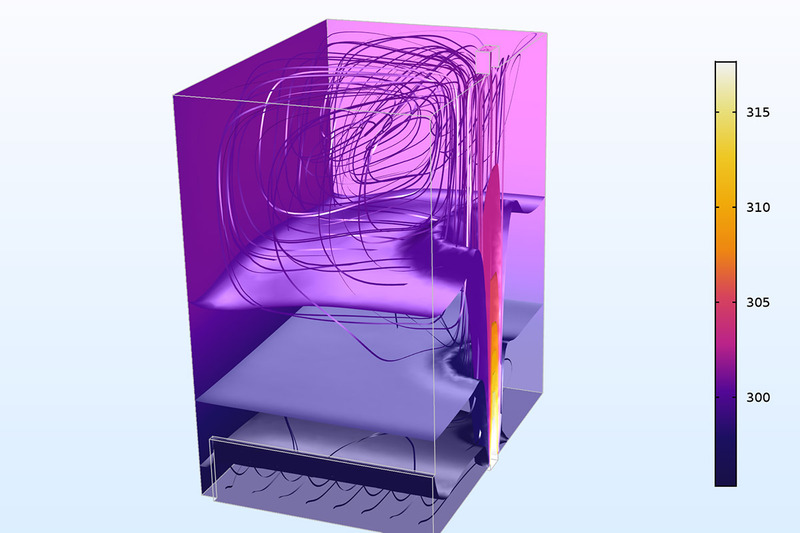 Displacement ventilation benchmark problem solved using the new weakly compressible flow option. 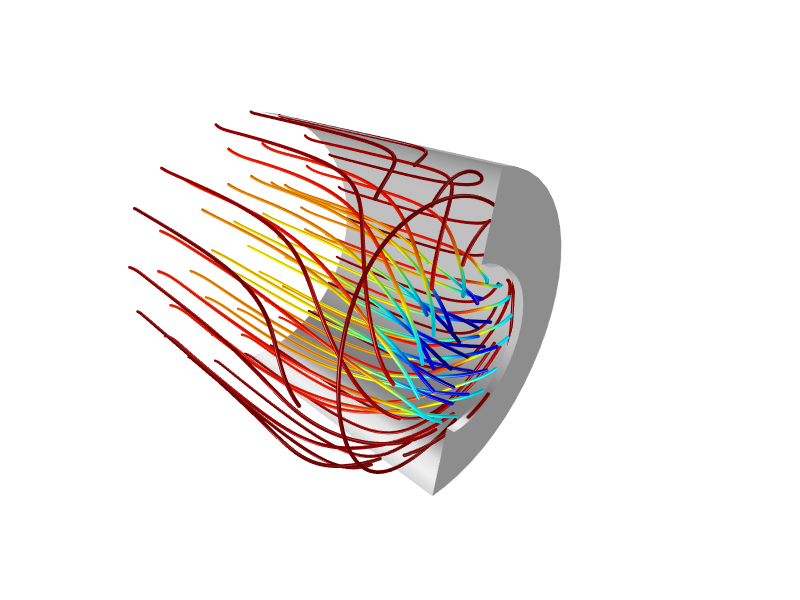 The plot shows temperature (K) on isosurfaces, surfaces, and on the streamlines for the velocity field. For the Incompressible flow option, the Reference values and are used to define the fluid properties, such as and . For the new Weakly compressible option, the fluid properties are functions of the temperature (preferably taken from a Heat transfer interface), but not the pressure. Hence, and . For the Compressible flow (Ma<0.3) option, both and are used to evaluate the fluid properties. The notation (Ma < 0.3) indicates that the stabilization and boundary conditions may not be suitable for higher Mach numbers, although the fully compressible form of the continuity, momentum, and energy equations is solved. A gravity property is now available for the Single-Phase Flow and Non-Isothermal Flow interfaces. 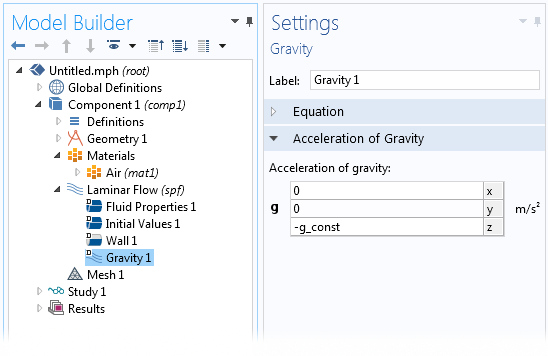 When you select the Include gravity check box, a volume force equal to is added on all domains where the fluid flow interface is active, and a Gravity feature appears in the model tree. The Gravity property adds an option to compensate for the hydrostatic pressure where a pressure-type boundary condition is specified, such as an Outlet, Open Boundary, or Boundary Stress condition. There is a possibility to define a reference position that defines where the pressure and temperature take their reference values. The reference position is used by the boundary condition features to compensate for the hydrostatic pressure. For example, when the option to compensate for the hydrostatic pressure is selected for an Outlet boundary, a pressure distribution equal to is added to the user-defined pressure on the outlet. This compensation is exact for incompressible flow, while for the other two compressibility options, it provides a good approximation of the pressure profile on the outlet. Additionally, there is an option to use the reduced pressure, for example, to automatically include the hydrostatic pressure in the definition of the dependent variable for pressure. Simulation of a lock-release gravity current generated by a salinity discontinuity. When you are simulating incompressible nonisothermal flow using a material for which the coefficient of thermal expansion is defined, a buoyancy force with a linear temperature dependence is automatically added, while all fluid properties (such as density, viscosity, and thermal conductivity) remain constant. Generally referred to as the Boussinesq approximation, it is a popular modeling approach for nonisothermal flow applications. As an alternative to specifying the linearization point using a built-in material, you can define the reference density and coefficient of thermal expansion explicitly in the Non-Isothermal Flow Multiphysics node. Temperature (top) and velocity magnitude (bottom) for convection between parallel plates heated from below, simulated using the Boussinesq approximation. 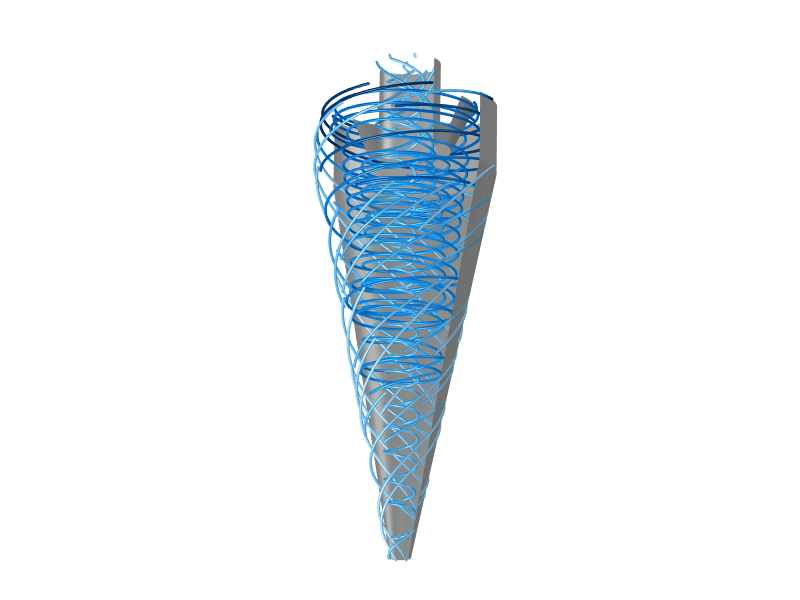 An option for Swirl flow can now be chosen as a Flow direction at an inlet. The swirl on the downstream side of the fan is determined by setting the rotation rate and a swirl ratio, defined by the angular velocity of the flow compared to that of the blades. Swirl flow generated on the downstream side of a fan placed at the inlet to a duct. To enhance the study of fluid flow and reactions in gases and liquids, the new Reacting Flow multiphysics interface combines the Single-Phase Flow and Transport of Concentrated Species interfaces. 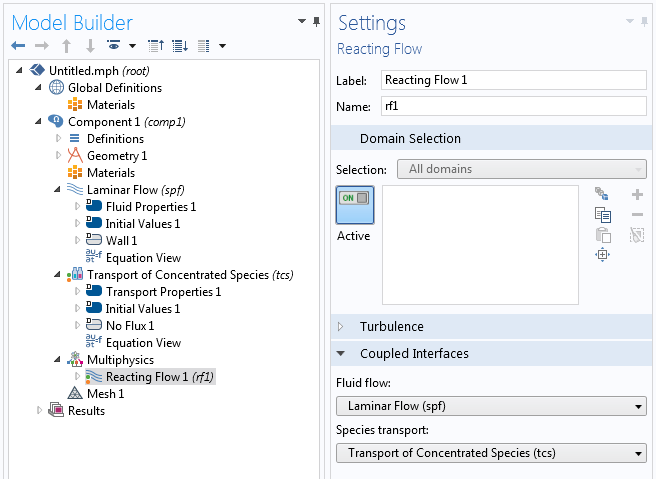 Previously available as a standalone interface, the new Reacting Flow multiphysics interface gives better control of the settings in each physics interface as well as the multiphysics coupling between them. Using the new Reacting Flow coupling, the process of solving any of the coupled interfaces separately, or at the same time, has been significantly improved. For reacting flow, this is important in order to generate suitable initial conditions or to test how the results are affected by coupling. The Reacting Flow multiphysics interface supports both laminar and turbulent reacting flows, as well as flow and reactions in porous media. The new Porous Media Transport Properties feature enables you to study multicomponent transport in a solution flowing through a porous medium. The new functionality includes models for computing effective transport properties that are dependent on the porosity of the material in combination with transport in concentrated mixtures. The porosity distribution in a reactor for the thermal decomposition of methane on a solid Ni-Al2O3 catalyst is studied using the Porous Media Transport Properties feature. The porosity decreases as soot forms in the decomposition reaction. The new pseudo time-stepping functionality for the Transport of Concentrated Species interface significantly improves the convergence rate for the solvers for stationary studies. It is specifically beneficial when the flux of species is dominated by advection (large Péclet numbers), for example, in turbulent reacting flows.